As more and more people choose WhatsApp as an important tool to communicate with friends, family, customers and colleague etc, which does bring us much convenience. As WhatsApp is not a perfect instant messenger app, we are not perfect whatsapp users. We may delete all the whatsapp messages by mistake, or get whatsapp messages lost with no good reason at all. 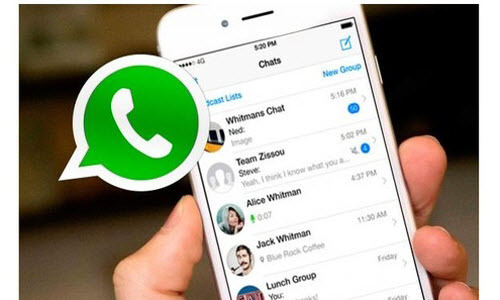 As whatsapp messages carry important information of our daily life and work, it is necessary to learn different ways to recover the deleted whatsapp messages depending on how you have lost your whatsapp messages and whether you have backup file. WhatsApp is designed to save your chat history or messages automatically on a daily basis. If you are uninstalling and reinstalling WhatsApp, you will be prompted with a message to import your backup after you first open your new copy of WhatsApp. Tap Restore and your chat history should appear. Make sure you import your chat history before the file expires, as backup files are only valid for 7 days after last saved. To recover your chat history from an iCloud backup, first verify that an iCloud backup exists in WhatsApp Settings > Chats > Chat Backup. If you can see when the last backup was performed, delete and reinstall the app from the App Store. After verifying your phone number, follow the on-screen prompts to restore your chat history. The same iCloud backup requirements apply for iCloud restore. In addition, the phone number used for backing up and restoring must be the same. You cannot restore the chat history from another WhatsApp account. If you share an iCloud account, this will allow you to keep your backups separate. If you back up your iPhone to iTunes regularly, you should have an iTunes backup file on your computer. Provided that the iTunes backup includes the deleted whatsapp messages, you can restore your iPhone from the iTunes backup file to retrieve the deleted WhatsApp messages. Hre is how. > Click restore and wait for the process to finish. Your device will restart and then sync with your computer. > Stay connected until the sync finishes. If you have no backup file at all, you can try recovering deleted whatsapp messages from iPhone directly and selectively. All what you need is a third party iPhone data recovery software named iFonebox. 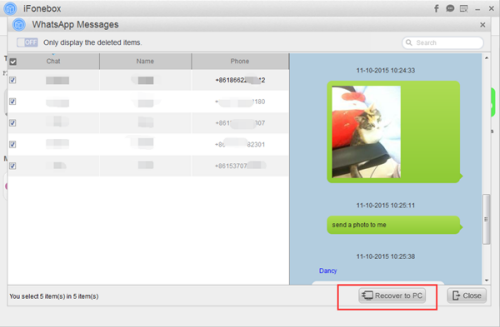 Here are the detailed steps about how to recover deleted whatsapp messages from iPhone with iFonebox. Note: iFonebox is available for both Windows and Mac , please choose the right version to download and install. This entry was posted in iPhone, Tips and Tricks, whatsapp and tagged export wechat photos from iphone to computer, iphone wechat photos, view iphone wechat photos on computer by IosdroneD. Bookmark the permalink.